If April means spring to you; get out your gardening tools and get moving. A successful garden begins with good soil. Organic material is important to soil composition. It helps with drainage and increases the microbe population. Expanded shale is used to break up hard compacted clay soils. Top dress your flower beds and containers with organic mulches. Hopefully, you have your tomatoes, peppers, squash, and other warm season vegetables already planted; if not get them in the ground right away. 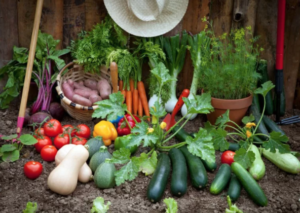 The best April gardening tips to get the highest yields is making additions of fertilizer every couple of weeks, starting about a month after transplanting or seeding. If you want to create a truly dynamic garden, inviting colorful guests like butterflies and hummingbirds is definitely the way to go. Butterflies like sunshine and plenty of space to fly around, so opt for a sunny, open spot. Both enjoy having some type of cover as a resting spot. Your garden should include some type of water feature as butterflies and hummingbirds often congregate around water. Visit Argyle Feed & Hardware today for all of your April gardening tips and needs including Bonnie Plants starter vegetables and flowering plants, seeds, potting soil, soil supplements, mulch and fertilizers as well gardening tools, hats, gloves muck boots, and wheelbarrows. We also carry organic gardening products from Soil Mender and Miracle Gro. This entry was posted on Wednesday, March 13th, 2019 at 11:21 am	and is filed under Garden, News & Updates. You can follow any responses to this entry through the RSS 2.0 feed. You can skip to the end and leave a response. Pinging is currently not allowed.